A handsome stranger leading a packhorse approaches the refugee camp from the North. The man is well-dressed and his sword is peace-bound in its scabbard upon his hip. An Ebon Blade pin is visible upon his woolen tunic. 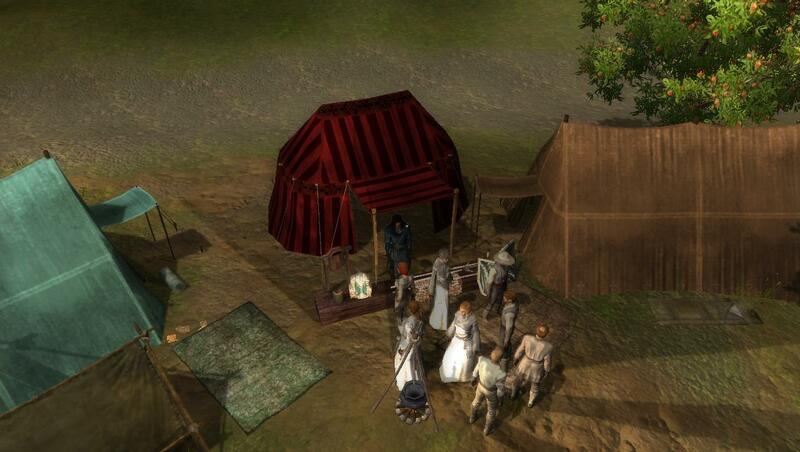 He quickly sets up a tent of a rich burgundy color, with a small foldable counter. Upon the counter, he places examples of a few fine weapons, armor and fighting gear. Finally, a small sign is planted in the ground. "Militia and Mercenary recruitment; sign up now!" The fellow tends to his horse as a crowd begins to gather, then quaffs a small potion. Appearing quite refreshed, he then speaks. "Good people! I am Tytos Lyonson, of the Ebon Blade Mercenary Company. Unspeakable hardships have befallen you of late, one after the other. Loss of home, family, loved ones..." He looks over them appraisingly, before continuing. "Yet I would not insult you with pity, for you are still here! You still draw breath and cling to hope, or vengeance.. There is strength here, in this very camp. I do not see victims in need of endless handouts and indignation; I see fighters, survivors!" Tytos produces two sets of scrolls, and places them both down upon the counter. "And so, I offer you a hand up! Those of you who have experience in battle may apply to become mercenaries, as I am. The pay is excellent, complete with signing bonus. Myriad benefits and prestige await new Blades up North in Soubar." "Those of you who have no such experience are welcome to apply to the Soubar Militia. The Ebon Blade will provide a safe bed and two meals a day to all who are accepted, as well as a salary matching the City Watch here in the Gate. There is a signing bonus as well, that you need not wait for pay to purchase life's more urgent necessities." He pauses, smiling, before continuing "What say you then? Will you sieze this opportunity?" Tytos stands ready to answer any questions they may have and happily signs them up if they express an interest in doing so. He is there for the better part of the day, and returns again the next day. IC: The honeyed words of the orator ensure this recruiting session is successful; with five persons getting to the point that they will sign on who are fit for military service. Its obvious, however, that there was a dulling affect on interest when the fact service would be in Soubar became clear, and when the view of the Order of the Radiant Heart and other paladins, who have done much to protect the camp, also became clear. Its possible that such standards may slip over time, however. With the Refugee Camp changing population to half, leaving mostly able bodied and youthful members, Henryk, the Sword of Tyr, Knight of the Holy Judgement in the New Church of the Even Handed, remains steady in his position as tutor to the by-now-known-in-the-camp-and-maybe-beyond The Tymount Ten of Tyr's Justice, as they have been called...or just the Tymount Ten. Being formed of refugees, many from the town's militia, these Ten have shown their mind and will to be one of defending the Camp, their people, and remaining in the vigilance, and thus remaining in their training...to which Henryk the Sword of Tyr obliges them with regularity, during each Tenday, irregardless to the weather or the events, as best he can, to continue their training in both prowess AND Faith...for Henryk is knight errant, crusader, to the Just God himself, and brings with his skills behind the sword the greater teachings of the Divine. In his way, in his tutelage, Henryk impresses upon the Tymount Ten, and any others that observe the training, that deliverance of just vengeance, for the loss that the Tymountians AND the Troll Claw hamlet folk, will be theirs...if they maintain devoted and just in their actions. Of this, Henryk identifies, promotes and supports the great will and fortitude that is shown by the People that remain, TOGETHER, in the Camp...and the actions of the Tymount Ten and others that keep the people in solidarity...so that when the time comes, the righting of wrong shall happen, giving these people back their lands that have been stolen from them by forces of a great Evil. "Goodness is not a natural state, but must be fought for to be attained and maintained...your People are being supported by many who will not abandon you in this winter's unrest! Doors and gates are being opened for you, so that you may temper this time of woe and gain skills and strength to prepare for the time to come. Do not abandon your thoughts on your home lands...do not be seduced by offers of wage and servitude that cannot be valued to gain you security for your families, in a peaceful and fortified land. If you wish to fight, if you wish to survive...do so for your own Truths, not as expendable hands and bodies to organizations worded to exist with lawfulness and goodness in their hearts...in their own villages!! You, the Tymount Ten, already blaze brightly with your work, in the actions that radiate from your heats. Let that lead by example, among your own Peoples...and provide guidance, show Faith, give help to those that stand here NOW, with you...until the time comes in short when a more prosperous time is rightly granted back to you." The Selunite priestess formerly visiting the camp, is seen more frequently amid the refugees as the cycles of the moon wax and wane, so too does her appearance and style of dress seem to mirror its phases. She wanders gently through the encampment on bare feet, in naught but a thin and see through silken gown of a light ice blue hue, carrying not her usual lantern but a harp made from dark cherry wood and set with silver inlays to decorate it's surface with leaves and branches. She gently plucks at the strings as she serenades the moon. Set your gaze upon the moon this night.. The lucid rays that never fall in vain..
As the goddess relieves you of your pain.. I have wandered here beneath twinkling stars of old..
With her friendly warmth to shrug off the winters cold..
Like faded memories of smeared ink..
Let not life pass by as you blink..
Take heart instead by the beauty of night..
Let perils rest and fear take flight..
For as the silver rays coming down from above..
You're Beautiful, luminescent and filled with love..
She hums softly as she continues to play the chords on her harp, smiling full of encouragement to those she meets on her nightly rounds. IC: The priestess is remembered from her previous visit. There are some who have been hardened by what they have seen, particularly the attack; but many have their spirits lifted by this spokesperson for Selune's Grace. It is visits such as these that help to keep morale up in the camp among those who do not depart for new lives. "Life is but a mystery to revel in, let the stars guide you through the mist." "We remember cities now in ruin and forests murdered, yet still we sing to the stars and hope for renewal." A small notice is posted up near the gate to The Radiant Heart chapterhouse. "The Ebon Blade keeps company with and assists Drow. This can be attested to under oath by members of The Radiant Heart. Consider this before you consider service." OOC: Approved by DM Golem, response included above. 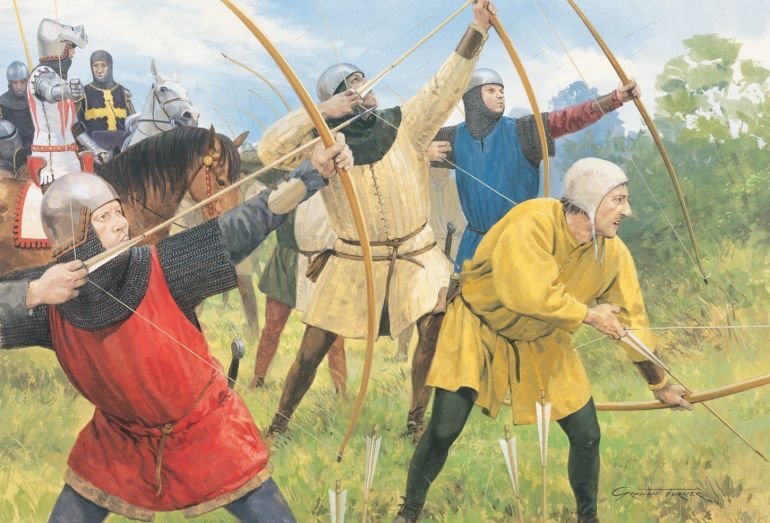 With regularity, as he had promised the Tymount Ten disciples-in-melee-training, The Sword of Tyr, Henryk the Damaran, knight-errant, gives good lesson during the scheduled Tendays. Until the Tymount Ten promise their Faith to Tyr, or until another cause disbands them, Henryk appears to train on greater skills, greater power...for it seems that he himself, does discover new means in which to apply his Faith into his own sword (and arm). "Protect the weak...that is such that you must take into heart, into your growing Faith. Do you not keep such high Faith, have you not seen the divine blessing that the Even Handed God does grant those placing themselves into faithful service? The arm may grow strong, and the body may harden in practice...but it is what comes from your heart, that which can radiate from the heart...that is where a great channeling shall occur, where all promises and codes do open the divine door to the realm of your Lord in Faith...and through that service and dedication comes His blessing, comes the Holy powers into your weapon, comes Divine might into your strength to abolish the Foes of Evil that beset you...."
Henryk the knight errant once again, from this moment of Faith Training that he has applied himself to, raises up his sword among the Tymount Ten assembled in circle of which they train, and with a calling in prayer, Henryk channels his force of personality directly into his form with a burst of light around him, a divine might of Even Handed God's blessing, for the Ten to see, for all around them to see. Then, on top of his radiant increase, Henryk places concentration upon his exotic blade held high, calling the name of his Lord once more into said blade, after which the blade itself pulses with the Holy powers of light and goodness. Fully empowered by his continually growing Faith and Dedication in Grimjaws, the knight errant parries with any number of the Tymount Ten, giving them a direct but non-deadly experience of what great Faith in the Just God, does grant he or she willing to bring Just Vengeance to those set against the goodness of Law. "You Tymount Ten grow in melee skill...but you are invited by myself and the New Church of the Even Handed to take up a Code of Faith to the Even Handed, to Tyr, and thyselves look become willing weapons of the Just God's dogma, to find charge to reveal the truth, punish the guilty, right the wrong, and be always true and just in your actions. Let you know that you may take the New Church into your hearts, and bring the New Church into your Lives as Tymountains...and eventually, as must be planned and executed one day, the return to your homelands...for which you work so diligently toward in your trainings. The Faith will give you guidance, strength and perseverance against future Evils that may threaten your Peoples...and the Just God give you strength to withstand all strikes against you and yours. I shall lead you into this, shall you give me but the word to do so." 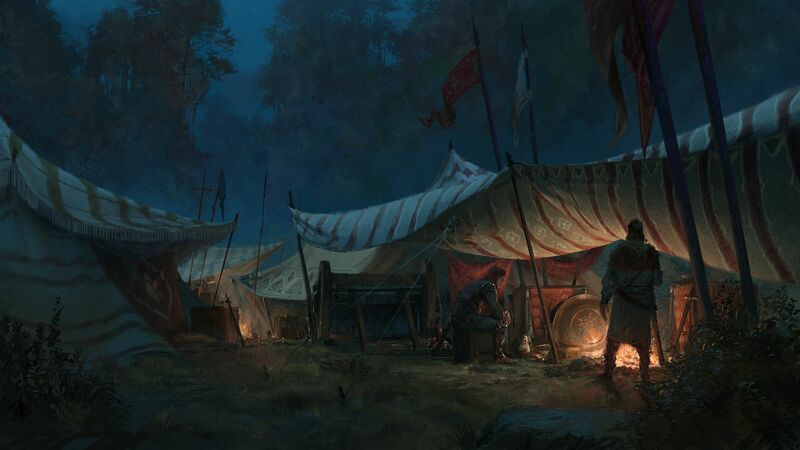 Later, after his words and the training is over, Henryk can be seen tending to the remaining refugees camped in the farmlands, by querying their needs for warmth, with offers of providing coin for any needs unfulfilled. And if such offers are refused politely, but he may witness and faces of despair born of the length of time these villagers wait upon some resolve to their refugee situation, he offers consoling words and prayer...placing emphasis on the righteous outcome to those that remain strong under lawful deeds, reminding any that listen that goodness is not a natural state, but must be fought for to be attained and maintained. The young Tactician of the Red Knight can be seen often moving about the camp. He would offer comforting and encouraging words to those he passes. Before moving to take a position on guard duty, he would offer prayers to his Lady of Blessing to boost the peoples and Consecrate the land to to ease the burdens of those of the camp. 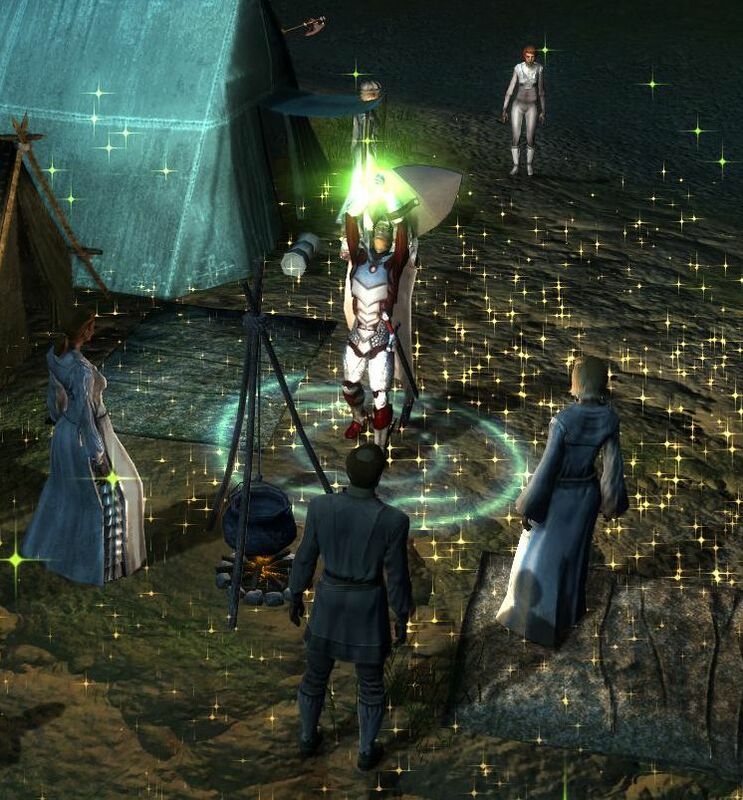 IC: The presence of the Radiant Heart Knight, and his prayers, boosts morale in the camp. It is likely the presence of individuals such as these that keeps order in the camp. "A proper example is a greater weapon for Good than the sword." Looking over the situation, Derik would also offer his services to help train in combat those in the Camp who have already volunteered to do so. At least while he is available and able to make the trips to do so. The training goes well, with the miliita of Tymount not part of the Tymount Ten and several others welcoming self defence lessons - particularly after the demon attack. If the lessons continue to be free Derik has a modest uptake - in fact he would be able to train thirty on and off, but for his own lack of time! Other instructors could meet this demand. Derik would indeed continue training as he could those who wished to learn, and the lessons would indeed be free. This would take place 2-4 days during the week for several hours each. He himself would focus on blade and shield work and mostly defensive stances, designed to keep beginners alive. He would purchase basic equipment himself and supply the trainees if they didn't have any. Having some premium equipment from lootings of his adventures, he holds off on this still to see if any get to the point they would need or desire that level of gear. He would also ask Lylan, one of his Bladestone instructors, to aid him in training those who are faster and more agile, and thus better suited to the fencing style than the shieldman. He would also indicate to those he was training that eventually, when the Bladestone Foundation opened when its interior was finished, he would be in need of capable hands to guard students traveling to and from, as well as just basic employees and staff. Those interested, if they chose not to return and defend their homes, could seek him to apply. IC: The training is attended well. There is a committed core, and a larger membership that does not attend each lesson and is less motivated. Those ones are likely to gain only basic skills but there are some more promising members. The offer of work is met with questions as to the pay package! The distance and danger means at this point, only three seem interested. Perhaps as skill grows, and with enough financial incentive, more may take up the offer. Derik Ranloss: Thugging for GREAT JUSTICE!!! IC: The food and weapons are gratefully received. The Golden Arrow seems to have itself some firm recruits now! The Sword of Tyr, Henryk the Damaran, knight errant and currently vassal to the New Church of the Even Handed God in Baldur's Gate, is this day seen canvasing among the Tymountains, and to an extent the Hamlet refugees, seeking to make contact and words with the remaining leadership of the People, on the issue of gauging the desire and intention to return to the north, to their homelands, that have been unlawfully taken from them so many months ago, now. The knight errant is keen to learn the remaining desire held close to the heart by the refugees that are both stationed still in the Camp, as well those that have moved toward a place in different societies, like within the Gate and even farther a field—do these Peoples still desire a return to Home, to the lands that their Mothers and Fathers toiled, and is now, with assumption, abandoned? In his way, the knight errant Henryk seeks those with rank within the community of Tymountians and the Hamlets, for it would be his nature that these leaders carry a drive through their charisma to hold the community together in order to fan the flame in the hearts for a just return. With his regular training of men and women, some becoming regulars under the title of the Tymount Ten, it is easy for Henryk to be located by any representative that may carry such answers with truth behind them. Nathan moved to check on the camp along with the latest shipment from House Darius. He spent some time checking on the shelters, asking what people feel they need, and seems prepared to amend the next order to include some of these specific requests. He spends the remainder of his time re-distributing flyers for work at the House, as he had upon initially arriving with the first of the deliveries. Any who asked would learn there was short or long term work available, with the long-term positions being guard duty with training and equipment paid for by the House, as well as living quarters in an apartment or the new Estate's barracks upon its completion. Before he leaves, an impromptu juggling act is given to a group of children. OOC: Approved by DM Golem, except for struck though part as families and children are quartered in the city now! With continued regularity...the titled Sword of Tyr within the new Church of Baldur's Gate, Henryk the Damaran, knight errant, provides again a Sermon of Training, that is aimed to not only benefit the Tymount Ten—as they have been named—but a presentation open to all the remaining refugees with the camp that stand tall and proud, a People still united, against the forces of weather and Man that may bear upon them to divide them, from origin and culture. Goodness is not a natural state...but must be fought for to be attained and maintained. This is not the easy path, nor is should any one man or women expect life without toil. In the honest and willed perseverance, does the strength of character radiant in golden, divine color...for all to see, for all to bask in. This may come from you, may radiate from you...by remaining in the truth of your position, of your struggle, of your will to fight, to Crusade, for a better experience...and duly more so then where you find yourselves, this day. You have braved the situation with admiration, each of you...and though some of your fellows, both Tymountians and those of the Hamlets, may take more comfort and shelter within stone walls or under promises of fortune, you remaining men and woman are locked in a great battle of redemption, reclaim what has been taken from you, and...deserving of a divine blessing, if ever Gods would look down upon a suffering People. Thus, in interim, there be many a better-off and skilled individual and group that has lent aid to your situation, a great gift in goodness is delivered at times, and this should be taken as sign that the Triad and other Powers do hold you at the balance, on the scales, at even...giving you, each of you, the Right and Just Moment to lay heavier weight on the scale of Good, on the scale of your improved future, a return to your homelands, on the scale of seeking out Faith in dedication, so that it will return greater blessing upon you, should you wish to call upon it. To Faith, I say to you...take it up, like you may take up a warming elixir or a warm meal of venison or fish provided...take up the Call and receive the Blessings in your hands, in your swords, in your bodies...which will greater nourish you than you think, and hold you in Truth and out of punishment. Let the Laws of the Divine grow and flourish in you...as one day they will unlock to you the gates to the Seven Heavens." Henryk the Damaran, knight errant to the Church of Tyr later makes a round through the camp, checking to see if earlier offers of coinage and support for warmth were fruitful, and if further support is needed on a direct, one-to-one basis of the refugees. There is a particular focus on his part to touch base with those keeping the Camp in order—the militia, the politicians—and make sure they are in adequate support. If there are any disagreements or law-breaking issues bearing upon the People, he offers his sworn Faith in the Even-handed God, to give balanced thought to judgement on the outcome. IC: There's mixed interest, with many giving it a try, but not so many willing to take up the training, beyond those already signed up. Some skills do rub off on those who come back more than once though. Later, its said Remmy had a meeting with the Mayor. The training of the core group and larger, basic group continues as Derik does more of this and a bit less adventuring perhaps. He would welcome also those who wish to learn from the other "groups" of folk, such as those being armed by Remmy. Not only would he instruct on personal skill, but also give instruction on gear maintenance, and when he had large enough class would also give lessons on squad tactics. He would inform those that had expressed interest in employment that the pay of the guards will be <insert going rate for guards here> as well as room covered while at the Foundation once the interior was complete along with two meals a day. Travel to and from their shift rotations, likely via the nearby ferry, will also be paid for b the Foundation as able. Gear will be supplied by the Foundation with option of the individuals to buy it for themselves. Unfortunately, the Foundation will not be able to house whole families of employees while they are on rotation, it just won't be big enough physically for that. However, there will also be several other positions available such as inn-staff, stable hands, etc who will also be provided similar packages. IC: The trust built up by Bladestone training and the recent change in refugee circumstances, with the demolishing of Tymount, leads to interest in these positions. Notably, Derik's involvement in the attack on Tymount, considered by many to be rightful vengeance for their losses, promotes interest. However, Derik quickly learns its not feasible to travel from Baldur's Gate to Candlekeep, so any staff would have to be live in staff. He can recruit up to twelve assorted staff however, provided he makes provision for their board. While some refugees appear to have gathered employment from a number of interested individuals and institutions seeking workers from among the displaced. It would appear other refugees specifically seeking employment have arrived at the camps hoping for work opportunities. Their tale of woe a little vague or their home location beyond that which might be expected as direct Devil refugees. Meanwhile a trickle of what is a more obvious genuine article continues to occupy the site as the terrible terrors of Devil occupation is revealed. Corruption of life itself, a land torn open, a population devastated, bemoaning a certain doom and world end, they cry - Where have all the heroes gone?